Learning about the return of the BMW 8 Series was a good day. Seeing a few leaked photos of the concept made it an even better day. Finally clapping eyes upon the official concept today? I don’t even know what to do with myself. 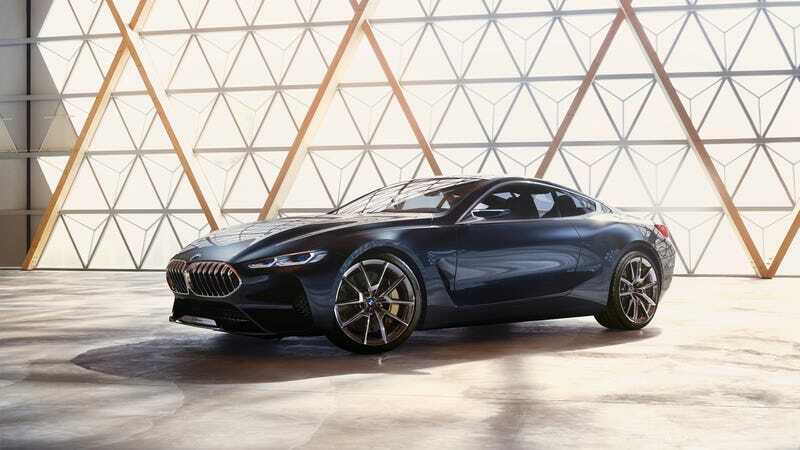 Unveiled at the Concorso d’Eleganza Villa d’Este, this is a preview for the 8 Series Coupe, scheduled for a 2018 launch. It looks extremely promising. Marketing-yammer aside, the 8 Series Concept is a striking thing. The nose and tail have got a little of the i8's design elements in them and the lines are just so damn elegant. Sure, the front also looks slightly like a flattened head of some bottom-feeding fish, but it’s still very sleek. It looks like what the 6 Series Coupe would have evolved to look like. I won’t hide my excitement for this car. In an age where coupes are dying and SUVs are taking over, I’m glad that this what BMW had to show us today. Its flagship spot has remained vacant for far too long. Does Your Car Have More Computers Than A BMW 850i?